14 Oct 2012: [Extension] The extension is still wood lined, and not totally pretty as it is a mixture of aluminium bits, tape, rough OSB, screwheads etc. Tempting as it is to just paint it out with hi-build paint, my wife wants a proper job (and so do I), so I am going to plaster it out. I don't think I could wet plaster it, as it wouldn't stick, and Id make a mess of it, so it is being dry-lined with plasterboard on dab adhesive. Cutting the plasterboard is very easy with a stanley knife, and the extension is so modular in sizes, that so far, there hasn't been a single square centimetre of waste plasterboard. Here is the second sheet waiting to be cut. The sheets are all 90cm x 180cm. From the first sheet, the two waste bits seen in the photo all have somewhere to go, the narrow bits being reveal lining. 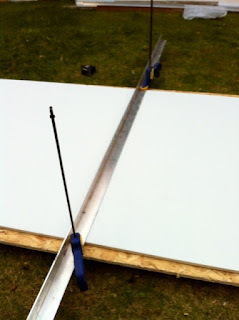 Having plenty of aluminium and clamps lying around, it is easy to get perfect straight lines and a perfectly straight edge - easy to draw the pencil and the Stanley knife along accurately. 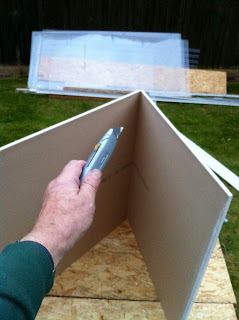 The boards split cleanly along the cut-line, and the reverse paper needs to be cut. Here we go with the adhesive plaster. I need about a quarter bucket full for each half board. A paddle mixer with the cordless drill is an essential component of the work, to get the right consistency in the mix of powder and water. The stuff is incredibly quick to go off, and sticks to everything, including me - so a dirty boiler suit is the right clothing. Its not practical to do just two boards and then clean up as you have such a mess to clear. Best to get all the boards cut, and do as many as you can in one session, so that all the mess is made at one time, and you can have one big clean up at the end. Roofing battens and spare OSB board are the ideal way to press the plasterboard against the wall until the adhesive sets - using the 'bowstring' elasticity of the battens. But by the feel of it, the adhesive glues it almost instantly, it feels very firm when first placed. 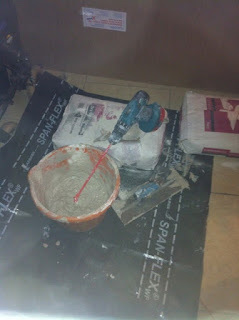 In the morning, the adhesive is going to be solid hard plaster so any waste must be cleaned off from the edges while it is still soft, and all tools and the bucket have to be cleaned thoroughly. 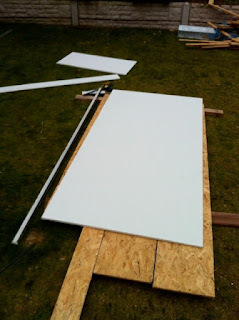 I have done only two boards, but have now got the hang of it, and know roughly how much adhesive is needed per square metre, so will do better during the week. 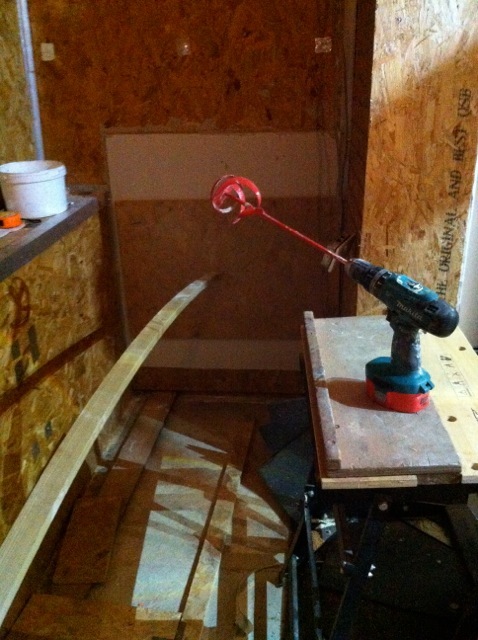 All the boards are cut now (for the walls), so I can make good progress. I will need to be a bit clever with the roof battens for the ceiling board, and can expect to get very dirty placing adhesive upwards. More thought on the solar shader - curve!